A key feature of CICS TS V3 is its ability to use CICS to provide an execution environment for Web services applications. 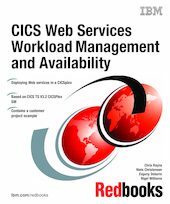 This IBM Redbooks publication contains the specific management requirements of such applications and shows how CICSPlex SM can be used to manage these applications in an easy to use fashion. We present an overview of Web services, discuss how CICS implements Web services, discuss the Web services support of CICS TS V3.1 and the enhancements provided with CICS TS V3.2, and give a small overview of CICSPlex SM and how the CICSPlex SM WUI can assist with both CICS Web Services installation and management. We also discuss the different techniques that can be used to provide high system availability and workload management for CICS Web service applications and how high availability is provided across a Parallel Sysplex. We then describe how CICSPlex SM is used to define and manage the required CICS definitions to run the Web services application and configure CICS as a service provider, show how to set up a CICS Web services requester application for high availability, and describe a practical example of a CICS Web services implementation based on a proof of concept for a large financial group.